Jennifer Prather laughed as she set down heavy luggage yesterday after her Honolulu-bound American Airlines Flight 31 had to return to Los Angeles after passengers reported smoke yesterday morning. 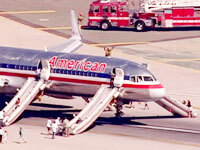 Passengers were rerouted to Honolulu later the same day. Passengers arriving in Honolulu last night on American Airlines Flight 31 recounted their harrowing experiences, including having to slide down inflatable chutes after an emergency landing in Los Angeles. An FAA official said the use of inflatable chutes is very rare. Passengers said an announcement was made early on that smoke was coming from the cockpit, and they could see smoke inside the cabin. Most of the 188 passengers took another plane and arrived safely shortly before 5 p.m. yesterday, hours after the initial plane departed Los Angeles yesterday morning. Passenger Ethel Takahashi of Los Angeles thought she might not make it to Honolulu for her 88th birthday on Saturday. Officials say about 188 passengers and crew evacuated to boeing 757. That's because a suspected fire forced the plane to turn around and, in dramatic fashion before TV cameras, the passengers evacuated via air slides. "It was so frightening," Takahashi said. "I thought I was going to die." Takahashi was one of the passengers on American Airlines Flight 31 who arrived in Honolulu just before 5 p.m. yesterday on a replacement aircraft. Passengers said they smelled smoke or a similar odor, and later smoke was visible inside the cabin. An announcement was made that smoke was coming from the cockpit, they said. The original flight on a Boeing 757, carrying 188 passengers and six crew members, took off from Los Angeles International Airport at 8:48 a.m., American spokesman Tim Smith said. A short time later, the pilot decided to turn back because of smoke or an odor in the cabin, he said. The plane landed about 57 minutes later, and "the captain elected to declare an emergency and get everybody out of the aircraft via the slides," Smith said, adding that one reason the pilot used the chutes was the aircraft was full. Six people including a child were treated for bumps, bruises and other minor injuries, a Los Angeles fire spokesman said. He said crews using thermal imaging cameras scanned the cabin and cargo hold and found no evidence of an active fire. Federal Aviation Administration spokesman Ian Gregor said: "You hear from time to time about planes returning to airports because an indicator light went on, but it's pretty rare that they actually deploy chutes." Passenger Michael Hurwitz, 48, of Newport Beach, Calif., was traveling with his wife and children, ages 9, 6 and 3. "I was sitting on my daddy's lap when we went down a slide," said his 3-year-old, Emily, possibly the youngest on board. Hurwitz landed on his knee and was bleeding. "When my feet hit the tarmac, the lady behind me took my legs out," he recalled. Many took the evacuation in stride. "It was kind of fun," said Sue Norton, 73, of South Pasadena, Calif. "It was very fast, unexpectedly, but it was a great slide, very steep and fast." Said Kevin Pontrelli, 9, of Orange County: "It was the best experience, but it was the scariest experience of my life." Mom Diana Pontrelli, 45, said she maintained her calm, as did most other passengers. "I think when you have your kids with you, you become this protector, stay calm and do what you need to do to make them feel safe." Many passengers had words of praise for American Air's handling of the emergency. Most passengers took the later flight to Honolulu, Smith said. Passengers said a pregnant woman was one of the few who opted not to continue on and was taken to a hospital to be examined. The American flight landed in Los Angeles as news crews awaited the arrival of an Airbus A380 -- the world's largest jetliner -- flown by Emirates Airlines. Their video of the emergency landing was widely broadcast yesterday.